These Buffalo Chicken Bites are seriously amazing and one of the best Weight Watchers Recipes I’ve ever made. They are a wonderful, much lighter alternative to traditional Buffalo chicken wings, but for a lot less Points. This an excellent dish to help you satisfy that Buffalo chicken craving. I like mine super spicy, so I served it with a side of extra Frank’s Red Hot Sauce, but they are also great as is, dipped into a low calorie ranch dressing or low calorie blue cheese dressing. Pair it with some celery for that authentic feel. These were so amazing, that my husband could not believe it was a light recipe. I’ll definitely be adding this to my list of must make Super Bowl Recipes too! A perfect low calorie alternative to Buffalo Chicken Wings! 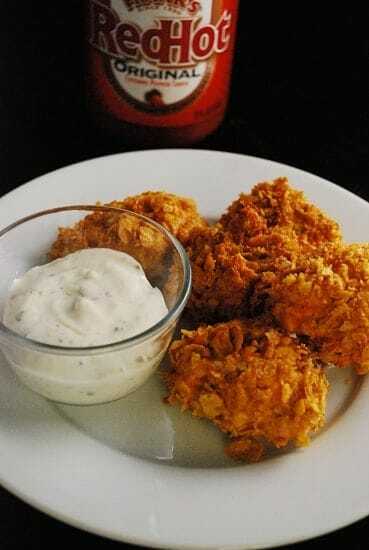 These Buffalo Chicken bites are amazingly delicious and a make wonderful appetizer recipe. Place on the prepared baking sheet and bake for 20 to 25 minutes. Serve warm with a low calorie ranch or blue cheese dressing. These are 7 points for 5 buffalo chicken bites. I made these for dinner tonight but didn’t have quite enough corn flakes. I did the last 5 or so using panko instead. My husband actually preferred the ones made with the panko ! I agree with everyone on here that there is no way you can get thirty balls. I made about 16 and I used 9oz of chicken. But they were delicious! I would suggest you chill your mixture a bit before you roll into balls. I even put my balls in the freezer to really firm up before I breaded them and it wasn’t nearly as messy. Loved this recipe and method! Thanks! do i measure corn flakes 2 cups before i crush them or after? Can you substitute something for the flour and corn flakes to make it lower in carbs? This recipe is amazing. Agree with the other posts in regard to the quantity but it is so good, it doesn’t matter. I have made this recipe 4 times to date! Thanks for sharing. Can you use real eggs? I know it throws the points off, but I am not doing the WW thing and would like to use real eggs. How many eggs would be equal to the liquid egg? Thanks so much for the help! These were super delicious, but I didn’t get anywhere near 30 with only 8 oz chicken. I got 16, but I didn’t use all of the corn flakes, flour or egg substitute. I refigured the recipe based on what I used (I also substituted 4 wedges of light laughing cow instead of cream cheese) and it was 4points for four bites. They weren’t big either, but still worth it! Super good!! The recipe calls for 8oz of chicken. That could be in 1, 2 or 3 breasts….just depending on their size. I use two 4oz breasts when I make it. We made these last night and they were pretty good! We only made 12 bites (therefore 2 were considered a serving), but we did notice that they didn’t hold together well. I’m wondering if we did something wrong..
something is wrong with the measurements, making them smaller than 1 inch, and only got 19. Just made these, they were incredible! 2 things. 1. Use cold chicken! 2. I used Frank’s Buffalo Sauce. Yum!!! How much will Points + differ if I use Light Cream Cheese – can’t find Fat Free… They look fantastic and I absolutely LOVE your website – made the coconut popsicles this morning! Oh my! I have to make these! Thank you!